There has been a lot of talk in the media about whose lives matter these days and who’s apparently don’t. In the Church we make a big deal about the covenants we make and about needing to keep those covenants. So I asked myself why covenants matter. After doing some research this is my initial response to myself. I would love to hear your own insights or thoughts on the subject in the comments below. 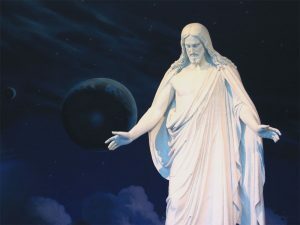 In The Church of Jesus Christ of Latter-day Saints, what do we do, that is of lasting consequence, that is not directly associated with a covenant? I pretty much drew a blank on that question. Everything I can think of that is of greatest value and that lasts the longest is tied to a covenant. Usually, it is directly tied to a covenant. Outside of the LDS faith, where in the Christian community do you hear people talking about making and keeping sacred covenants with God? Unless it has something to do with either baptism or marriage, in which case it is usually referred to as a sacrament, you don’t really hear much about covenants. Our church and our faith is replete with talk about covenants. We start talking to converts about covenants during the lessons about the gospel, and the conversation about covenants never ends. In our church we bump into another covenant at every turn. Most notable is our participation each and every Sunday in the Sacrament, which is the renewal and re-commitment of our baptismal covenants. From the time we get baptized until we have entered the temple, almost all we hear is temple this and temple that, and all the covenants we make in the temple. All of our highest forms of worship are centered around making covenants with God, our Father. What’s up with that? When the Lord sets the terms for granting us blessings, He attaches those terms to existing laws. If we obey this set of laws we are promised this set of blessings. Each set of blessings God promises His children are based on obedience to a specific set of laws. This way all blessings come from measurable and demonstrable behavior. There is no question in His mind as to whether we have earned a particular blessing, because either we have honored His terms or we have fallen short. If we fall short of the terms we agreed to He can bless us or withhold the blessings, based on how well we did and what our intentions and motives were behind our actions. Yes, He is able to measure such things. Covenants are the legal and binding contracts used in the eternal worlds. God sets the terms and we either accept them or reject them based on our moral agency. So covenants are heaven’s version of the binding contract. Covenants are almost always verbal. Sometimes we accept a covenant with an agreed upon physical gesture. Either way we always have to physically demonstrate our willingness to participate in the covenant. When we accept the covenant of baptism we physically go down into the water and submit to the act of baptism. When we renew that covenant we eat and drink the figurative body and blood of Christ in the form of bread and water. Even in the pre earth life we participated in covenants. The gospel of Christ that includes a Savior and Redeemer was given to us by way of covenant before we ever came to earth. God promised to send a Savior for His children, asking in turn for their obedience to His law. Before we could come to earth we all agreed to the gospel plan offered by our Father, and administered to us by covenant. This is how we “kept” our first estate, we accepted our Father in Heaven’s plan for our exaltation through the use of our moral agency by way of a Savior, who was Jesus Christ. Elder D. Todd Christofferson in a talk entitled “Why Marriage, Why Family” said the following about the covenants we made with God, our Father before coming to earth. If, while with God in the premortal spirit world, we would agree to participate in His plan—or in other words “keep [our] first estate”—we would “be added upon” with a physical body as we came to dwell on the earth that He created for us. The Savior used an interesting phrase. He called the people the children of the covenant. What covenant is He referring to? He is referring to the Abrahamic covenant. When God revealed to Abraham that he, Abraham was one of His noble and great ones, His most valiant children, He made promises to Abraham based on Abraham’s faithfulness to the covenant the Lord offered Him. The promises of this covenant are the covenants of godhood, which include eternal increase, eternal marriage, priesthood power, and exaltation in the eternities with a celestial body. These promises, these covenants are only available to those who are willing to live according to the commandments given us by the prophets through Christ’s direction. Anyone who is willing to live the commandments is allowed to receive the covenants, but only those who do accept the covenants and are faithful to them to the end of their lives will be honored with the grand rewards of what we refer to as the New and Everlasting Covenant of Marriage. The ancient prophets knew that not all the people of the earth would enjoy the opportunity to receive these blessings in their day and time. They knew from the Lord that the world as a whole would not be offered this set of covenants until the latter days. These ancient prophets were promised that in the latter days everyone would be offered this blessing. With this renewal, we have received, as did they of old, the holy priesthood and the everlasting gospel. We have the right to receive the fullness of the gospel, enjoy the blessings of the priesthood, and qualify for God’s greatest blessing—that of eternal life. Until the Savior’s day the blessings of the covenant were restricted to just the descendants of Abraham, specifically the posterity of his grandson Jacob (Israel). Today, if a person is not genetically a descendant of Israel they are adopted into the line of Abraham when they accept the Abrahamic covenant. Either way the blessings and the promises are the same. The Lord promised that scattered Israel would be gathered together again in the last days and that His covenants with Abraham, Isaac, and Jacob (Israel) would be offered once again to their posterity. The greatest compliment that can be earned here in this life is to be known as a covenant keeper. Why? Because there is only one set of covenants being offered by our Father in Heaven, and that is the Abrahamic covenant. Those who accept those covenants and keep faithful to their commitment to live by them to the end of their mortal lives are those who will be rewarded with godhood and the right to have a family in the eternities. These are the people who will live in the presence of the Father and the Son forever. Those who kept their first estate will be rewarded with a resurrected body and a kingdom of glory based on what level of righteous behavior they were comfortable with in mortality. Everyone will be very happy with the Lord’s generosity. 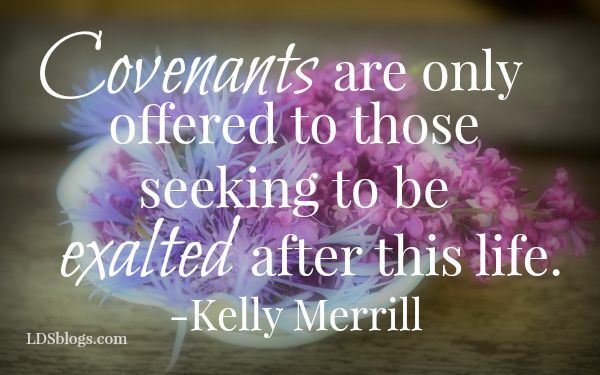 To read more of Kelly Merrill’s articles, click here. Covenants are only offered to those seeking to be exalted after this life. The process of covenant keeping began long before this life, and will continue long after this life. The covenants offered to us in this life were created before the world was formed, and everything Christ does in reference to our salvation is in keeping with those covenants we all accepted before birth. But only those who accept the New and Everlasting Covenant of Marriage, the temple covenants, and keep faithful to them will receive eternal life in the presence of God. Yes, we are a covenant people. Can you even imagine any privilege greater than what we have been offered through baptism in the Lord’s Church? These covenants are administered only through the Melchizedek priesthood, and exist only in this Church. This is why covenants matter.